My sisters-in-law are experts on making these Miniature Nut Cups, also known as Tea Tassies. These present themselves exceptionally well on a holiday cookie tray, and practically melt in your mouth. They are one of our family’s favorite holiday cookies. This project runs much smoother with team work, rather than solo, so I would suggest a helping hand if possible. This recipe makes between 80-100 pieces. In a medium bowl, mix the softened butter with the cream cheese. Add flour, and mix well. Cover the dough, and refrigerate for at least an hour, or overnight. Work with small amounts of the dough at a time, and keep the rest refrigerated. 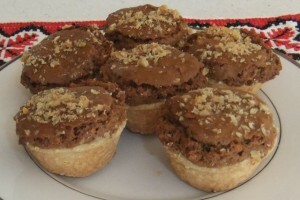 Place them in an ungreased miniatue cup form (much smaller cups than cup cake pans). Work with your fingers, to evenly line the miniature cup forms with the dough, creating dough cups. Pour hot filling into cups, filling them 3/4 full. You may sprinkle the tops with a pinch of finely ground walnuts. Bake in a preheated oven at 325F, for 20-30 minutes. Watch for the filling to set, which will be another sign that they are done. Cool them completely before storing or serving. While the first batch is baking, work on the next batch, until you use up all the dough. If you only have a single oven, you will most likely be able to bake only two pans at a time. It is much easier to make these cookies with two bakers. One working with the cup formation, and the other one is cooking the filling, fills up the cups, and bakes. Mix all ingredients together (except 1/2 cup of chopped walnuts). Pour into a medium saucepan. Cook on medium heat, until thick. Do not overcook, since it still needs to stay warm while filling the cups. I have seen lots of similar recipes which do not require the filling to be cooked, but cooking the filling makes a big difference in its texture. The cooked filling becomes very light and airy while baking inside the cookies. These are SO yummy! I just had some this weekend and LOVED them! Yes they sure are delicious! Not very sweet either…just perfect.